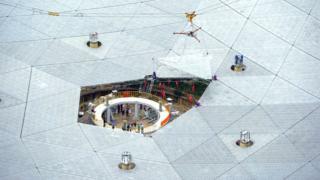 China has fitted the final piece on what will be the world's largest radio telescope, due to begin operations in September, state media report. The $180m (£135m) satellite project will be used to explore space and help look for extraterrestrial life, Xinhua news agency reported. Advancing China's space program remains a key priority for Beijing. Scientists are now due to start debugging and trials of the telescope, Zheng Xiaonian, deputy head of the National Astronomical Observation under the Chinese Academy of Sciences told Xinhua. What will the telescope do? FAST will replace the Arecibo Observatory in Puerto Rico, which is around 300m (984ft) in diameter, as the world's largest telescope. China has stated that its space program has peaceful purposes, but the US Defence Department has said it was pursuing activities aimed to "prevent adversaries from using space-based assets in a crisis," reported news agency Reuters. Beijing is due to launch a "core module" for its first space station in 2018.